I'll go over a few of our special items, if you please ... The San Damiano cross is above the altar, for it is the Lord who reigns supreme. And because it is Lent, there is a purple cloth around him. And because it was on sale and the only purple I could find, the cloth has polka-dots. I have since come up with the idea of the white symbolizing purity and the red symbolizing his most precious blood ... It works. 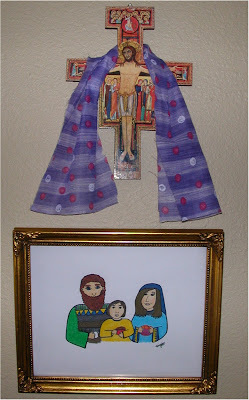 Beneath the San Damiano cross is a drawing that I made specifically for Saint Joseph's Day. 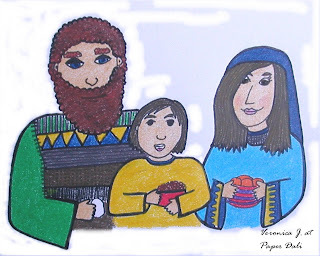 The Holy Family is gathered together having a little something to eat, and a young Jesus is talking to them about marvelous things. And below it is our little altar. The shoe box craft comes courtesy of Evann. 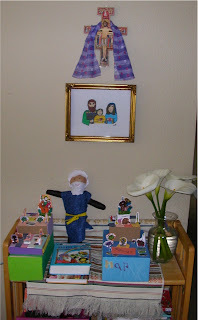 The printable pictures and explanations of them can be found at the St. Joseph's Altar blog. 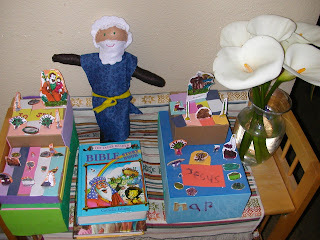 We also have a vase of lilies from our backyard, a children's Bible, and a St. Joseph soft doll. Here's a close-up of the soft doll. He's a bit rumpled, probably from tossing and turning from all those crazy dreams. 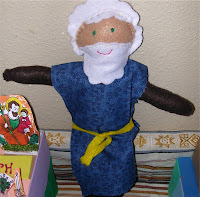 And because I had a little wooden peg, felt and a hot glue gun, I made a small Saint Joseph peg doll to add to the altar. He was easy and fun to make, and I am quite happy with how he looks. 1. Paint the face as you would like. Do this first, so as it dries, you can work on the following steps. 2. Cut a half-circle of green felt. 3. Cut a strip of brown felt. 4. Cut two small triangles of green. 5. Cut two beige circles. 6. Warm up the glue gun. 7. Put dots of hot glue on the wooden body of the doll. Quickly, drape the green cloth over it and make sure it covers the body. 10. Do the same for the other green sleeve and beige hand. 11. Put a drop of glue on the top of the green sleeves and press them against the body. 13. Cut black pieces of yarn in the same length, enough to be hair. 14. Put glue on the wooden head then press the black yarn on it. Be careful not to burn yourself! 15. Trim the "hair" at the length you'd like. 16. To make the lily, just cut a small half-circle of white felt. Glue one edge of the circle to the top of the toothpick. Swirl it around until it looks like a lily. 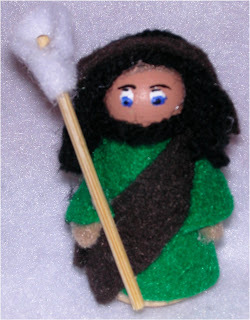 Then put a drop of glue on the toothpick and press it against St. Joseph. definately Paper daly style. Love your creations. Fabulous! Thanks for all the creative inspiration!!! peace! OK, then: I'm finally with the program. I LOVE what you've done with this site! You are amazing. 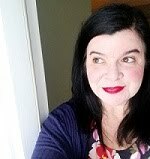 Now that I've finally got the *right* blog in my sights, I'll be back -- a lot!! !